As a rabid fan of DDR, I know that adding fun to your workout will make you more likely to do it. These folks proved it again by creating piano stairs. They measured the number of people who took the escalator versus the stairs before and then created the piano stairs. When they remeasured, 66% more people chose the stairs over the escalator. The next time your workout feels like drudgery, choose something FUN instead. Play a game with friends, workout with the Wii, or play DDR. Your exercise routine doesn’t have to be boring. It can be as fun as climbing piano stairs. I wouldn’t go so far as to say that salad is useless. 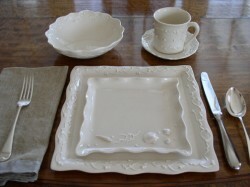 In fact, this plate is a great mental image of what your dinner plate SHOULD look like. With half of your plate filled with veggies of some kind, you’ll eat healthier and maybe even lose weight. You would think it’s such an easy thing to do. Just ask for a to-go box before you finish your meal. Ask the server to bring the to-go box with your entree so you can eat half as much. Yeah, it sounds so easy. The server forgets to bring my to-go box, so I ask for one and just sit there and wait for five minutes while they get around to bringing me one. It happens EVERY time and I end up eating a cold meal and hating my server in the end. Two weeks ago, however, I did something a little different. Sure, I asked for the to-go box with my entree, but I also saved my salad plate. I put it on the far side of the table and when the server tried to take it away I stopped him. 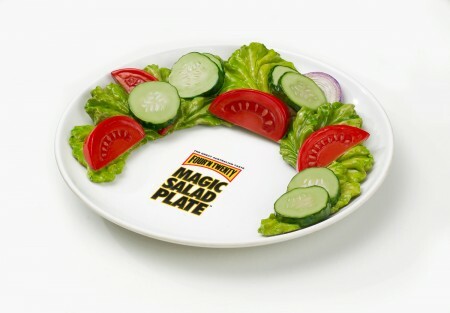 When he inevitably forgot my to-go box, I just cut my meal in half and put it on the salad plate instead. Because the second half of the food was on the salad plate, it felt like it had been contaminated by the salad dressing, so I wasn’t even tempted to pick at it. In the end, that inept waiter never did bring my to-go box, but this time, I left the restaurant perfectly happy. The November/December cover, however, looks strangely out of place. It’s WINTER, folks! Show a trim and beautiful girl in a snowsuit. Those sun-kissed locks and swimming trunks just feel wrong when we are feeling the winter chill. Working out in the snow is just as photogenic. I KNOW you folks understand cold and snow. You’re stationed in New York, for heaven’s sake! Cover art aside, this month’s issue seemed to be all about shopping. I know Christmas is coming, so it’s nice to have lots of present ideas at your fingertips, but I’m just not that much of a shopper, so over a dozen pages were lost on me. They just looked like huge chunks of advertising. The GOOD stuff, however, was really good! They tested the Skineez Thigh Slimming products and gave us their verdict. Did they help her lose inches on her thighs? I talked about Skineez back in January when they won the Slim Chance Award for Fraud and Quackery. It’s good to see that Fitness Magazine was independently able to determine that it’s not worth your money to buy Skineez. I absolutely loved this quick little article about hiking. Mount Hood is one of my favorite spots for hiking and getting away from everything. It was there that I got the inspiration for Merriton and my Wildwood Walking DVD was filmed in that area. The long walks clear my head and make writing easy again. It’s a workout for my body and my mind. 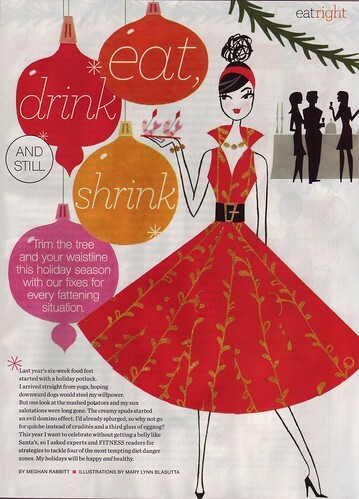 This article about losing weight during the holiday season was wonderful advice. There were tips to keep away from the food court at the mall and some instant motivation to choose a “nice” treat instead of a “naughty” one. 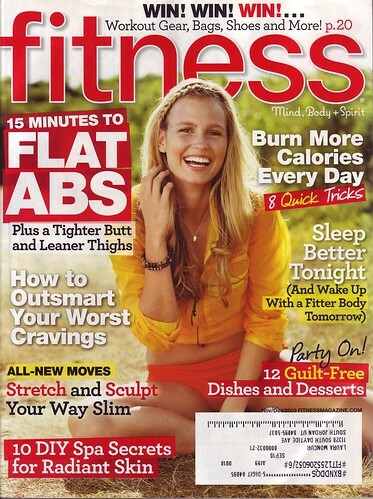 Pick up the Nov/Dec 2009 Fitness Magazine and check out what they have to offer. If your motivation is flagging in response to the holiday season, it’s the perfect pick-me-up to keep you on track for the next couple of months. They’re trying to choose blogs that promote healthy weight, exercise and lifestyle, so it’s no wonder Starling Fitness fits in there. Of course, I haven’t really exercised regularly at a gym for years. I ended up bringing the treadmill, exercise bike and weight bench to the new house and we have our own gym now. Even when we were incredibly short on square footage, we managed to fit the treadmill into a corner of the house. Whether you exercise at a gym or at home, the important thing is to workout regularly. 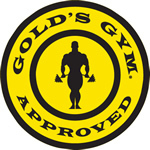 It’s nice to know that Gold’s Gym agrees with that philosophy. 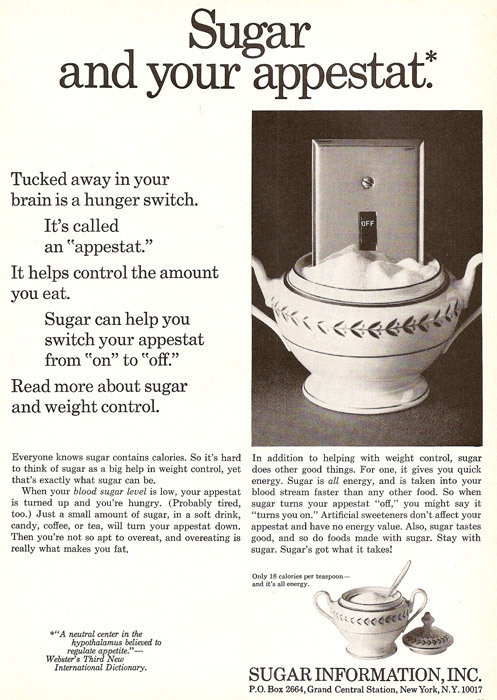 This 1968 ad from Sugar Information, Inc. is laughable. Tucked away in your brain is a hunger switch. It’s called an “appestat.” It helps control the amount you eat. Sugar can help you switch your appestat from “on” to “off.” Read more about sugar and weight control. When your blood sugar level is low, your appestat is tuned up and you’re hungry. (Probably tired, too) Just a small amount of sugar, in a soft drink, candy, coffee, or tea, will turn your appestat down. Then you’re not so apt to overeat, and overeating is really what makes you fat. In addition to helping with weight control, sugar does other good things. For one, it gives you quick energy. Sugar is all energy, and is taken into your blood stream faster than any other food. So when sugar turns your appestat “off” you might say it “turns you on.” Artificial sweeteners don’t affect your appestat and have no energy value. Also, sugar tastes good, and so do foods made with sugar. Stay with sugar. Sugar’s got what it takes! I don’t know who financed the Sugar Information, Inc. marketing campaign, but I have a sneaking suspicion it might have been people who SELL sugar. I doubt any doctors had anything to do with this information. Sugar DOES affect my hunger. Unfortunately, simple sugars like the white sugar shown in the ad, cause a rebound effect. After I’ve eaten something loaded with sugar, I tend to want MORE sugar after about a half hour. I’ve noticed the same effect with artificial sweeteners as well. I do much better with sugars found in fruit. I can eat an apple and be satiated for a couple of hours, but if I just swallowed a spoonful of the same amount of sugar that you find in an apple, I’m still hungry. It’s not the sugar that makes me feel full, it’s all the bulky stuff in the apple. Fiber and water satiate my appetite FAR more than sugar ever has. What we see here is a clear example of marketing posing as health information. We see that a lot, even today. Remember that idea that 2-3 servings of milk every day help with weight loss? The study was sponsored by the Dairy Council and has never been repeated with the same results. And that three apples a day diet? Yeah, that was sponsored by the Washington Apple Growers Association. The most important thing that we need to do when marketing is stronger than science is find what works for us. When you find a diet that makes you feel good, keeps your weight at a healthy level and leaves you with energy to spare, stick to it. You don’t need Sugar Information, Inc. to tell you what you should eat. Advertisement via: vintage_ads: Sugar Information, Inc. It is from the movie, Playtime, which was released in 1967 in France. Personally, I love to see the people of all sizes, sexes and ages dancing. It makes me want to get up and move!